Scotch eggs, a London favorite, are a super tasty snack. For this vegetarian version, the hard boiled eggs are coated in breadcrumbs and spices before being deep fried. They are delicious for breakfast and great to pack for a picnic. Place 4 of the eggs in a pan and cover completely with cold water. Bring to the boil then reduce the heat and simmer for 4 minutes. Cool in cold water before peeling. Combine the chopped herbs with the breadcrumbs and season. 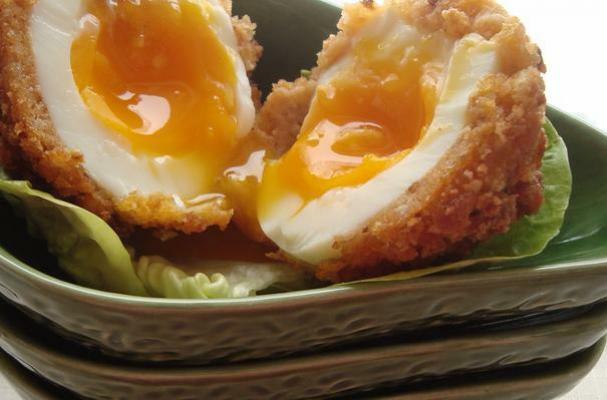 Gently roll each boiled egg in flour, then the egg mixture then the breadcrumbs. Put the oil in a pan to a depth of 2 inches/5 cm and heat. Fry the eggs until golden, turning occasionally so as not to burn - about 2-3 minutes. Remove the eggs with a slotted spoon and place in the oven in an ovenproof dish to heat through for about 3-4 minutes.